Sign ups are reopened and will remain open. If you signed up back in December or during one of the wrap ups you do not need to sign up again. This sign up is for individuals who have missed their sign up opportunities and still want to participate in the challenge. Instead of two giveaways, each wrap-up will consist of a giveaway designated by that month's host. Anything else? I think these were the two biggest issues / changes we've encountered, but we also want to hear from you! What's working? What's not working? What would you like to see more / less of regarding this challenge? While we're not going to implement too many changes for 2015, we want to make sure you guys are heard and we'll see what we can do for 2016's challenge! The challenged will run from January 1, 2015 - December 31, 2015. The sign up link below will remain open for the remainder of the year. Anyone can enter! You don't have to be a blogger, just as long as you review the book you've read. You can review on your book on your blog, Amazon, Barnes & Noble, Goodreads, etc. On the 25th of every other month (see schedule below), we will post a wrap-up for the previous two months. These posts will be done by one our bloggers and will contain a linky for you to add your own wrap-up posts and / or reviews. To help you tackle your TBR piles we will also be hosting Read Alongs on months that do not have wrap-ups (see schedule below). Voted on by challenge participants, Read Alongs will have two post dates: the first half of the book and the second half. Please note: You do not have to take part in our Read Alongs to participate in the TBR Pile Challenge. You can participate in all of them, some of them, or none of them. This aspect of the challenge is entirely optional. You don't have to follow Bookish to join the challenge, but you do have to follow us to be entered in the giveaways that are posted with the bi-monthly warp-ups. Wrap-up posts and Read Along will alternate months instead of being every month. We will take turns hosting wrap-up posts so you can see what everybody is up to instead of just one of us! If some of the details are unclear, please don't hesitate to ask us for explanation! You can leave your question in the comments below. If we don't respond in a timely manner, feel free to tweet Andrea @beutybutfunygrl or Evie @SeoEvie and we'll be sure to get back to you soon! 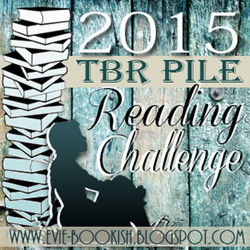 Write a post about joining the 2015 TBR Pile Reading Challenge on your blog. If you don't have a blog, post about it on Facebook or tweet about it via Twitter. Link up in the linky below using the link to your post/tweet. In your post, don't forget to include: the button/banner, link back to our sign up page, the level you are aiming for, and - if you want - a list of books you're hoping to read for the challenge. Place the challenge button in your sidebar (please use the grab link at the bottom of the post). That's it! You're done! Welcome to the challenge, stay tuned for lots of fun! And most importantly, good luck with tackling your TBR Pile!